Student Assessment and Reporting has come a long way over the past decade. The latest technology enables a Web-based user interface using SQL-Server to advance the dynamics of report writing into a new era. Our student reporting program, Reporter Pro, uses all these advantages plus intuitive easy to use screens for teachers who now require minimal training. Administrators of the program will be overjoyed at the ease of maintenance and time required to set up. Principals will be able to instantly see all reporting progress and print all variations of result analysis charts/documents. You can find more information about Reporter Pro and its companion product, teacher markbook in the Features page or you can contact us to discuss your requirements. 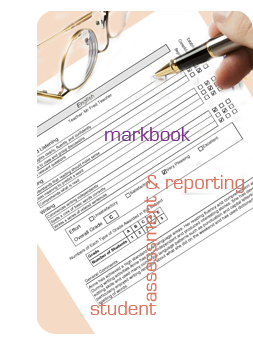 Teacher markbook provides a central storage, recording and analysis area for all your student curriculum measurement. We have developed an extensive range of student reporting designs. Click on this link and browse through the categories listed to select the template that best suits your school requirements. If you cannot find what you are looking for just contact us and our team of specialists will be happy to create the design for you. Soon to be released, our new Report Designer will put the power of advanced student reports in your own hands. Provides easy, 24/7 access from any computer, any location. Eliminates teacher stress and overload during student report periods. Set up your reporting and assessment structure from the first day of term, fill in progressively, and finalise the results and comments at report time. Aids in early identification of students at risk. A student’s entire results/report history is available online and easily accessed, enabling quick and detailed analysis. Improves communication with parents. Parents can be sent SMSs and emails when reports are ready and they can download a PDF version at any time. Enhances management of the reporting process. Principals can monitor teacher progress on reports through a simple red/green ‘traffic light’ visual plus the amount of time teachers spend on reporting. Enables fast track printing, collation and distribution of reports. Reports can be exported to PDFs, sent to a commercial printer or printed in-house. Allows schools to easily meet statutory reporting requirements. Regular, proactive upgrades are issued to meet requirements around Australia. If your school uses SAS2000, First Class or A+ there is no double entry of data.